For those of you who didn't get it from the static-riddled hint "transmission" I sent out last night, the left-pictured posters are what I will be giving away this week in #MCRchat thanks to WBR! 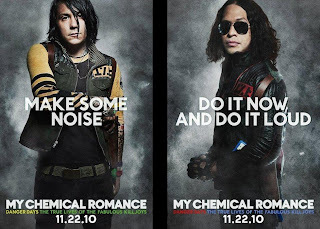 Those posters, or "snipes," as they were called, were sold on the MCR online store and their Winter 2010 tours for a limited time in a set that included Dr. Death Defying, The Girl, Korse and the rest of the Killjoys. Fortunately, there was a Fun Ghoul and a Jet Star left over to give away! 1. Follow @MyChemChat on Twitter. 3. I will make note of, then randomly select a winner from those who are actively participating in the chat. Unfortunately, because of shipping issues, I do have to limit the giveaway to U.S. only. Juding by the left pictured banner, found atop Blink-182's website, My Chemical Romance will be out with them for this summer/fall's Honda Civic Tour! The tour, traditionally, spans a couple months and makes its stops at amphitheaters across North America. The Honda Civic Tour just officially announced MCR and Blink as headliners on Twitter. According to the tour website, the bands will be supported by: Manchester Orchestra, Matt & Kim and Rancid. As those of you who read the recent fan report from Atlanta know, My Chemical Romance generously donated a signed drumhead to Brandi, the owner of My Chemical Freak, for her to auction for disaster relief in Mississippi. I am from the area in north Mississippi that was ravaged by the EF-5 tornado on April 27, 2011. Hundreds of people died, even more were injured and thousands are now without a home at all. The storm didn’t just mess up their homes, but it completely wiped them off the face of the earth. My town has spent the last few weeks working day and night trying to get help, food and shelter for our neighbors who survived the storm. When Brandi asked if she could auction the signed poster she got at her meet-and-greet, MCR did her one better and donated the above pictured drumhead. It is being auctioned via Facebook; as, many who were interested in bidding could not create eBay or Paypal accounts for it. In case you missed the live stream when I had it embedded here earlier, you can now re-live MCR's May 15 Big Weekend set, live from Carlisle, through the video below.